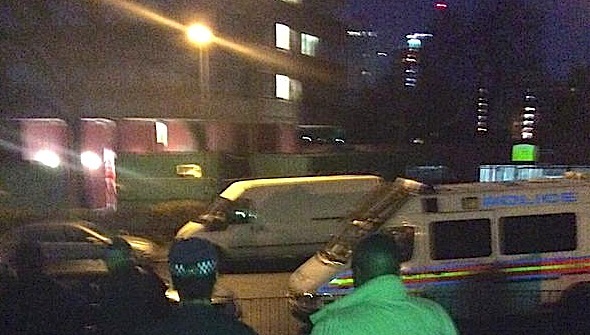 A HUGE gangbusting operation is under way in Hackney. Before sunrise today a convoy of vans and cars carrying 150 police set off to 11 addresses in the north of the borough. They arrested 10 people believed to be part of a network supplying crack cocaine and heroin and in one home, a hostel, found 100 rocks of crack. Among the arrested, most of them in their twenties, were a boy of 16 and a woman. Acting Detective Chief Inspector Dan Brown, who led the operation, which included officers from Trident Gang Crime Command, the Territorial Support Group and Hackney police, is determined to deter two gangs in particular, from violence and dealing in class A drugs. Neighbouring houses and flats were given a leaflet he had written, above, to inform residents of today’s actions and to let present and intending gang members know they would come under increasing police pressure. Hackney council was backing the operation, named Amber: Mayor Jules Pipe was briefed yesterday Tuesday 2 Dec 2014. The raids were made after what Brown termed a series of “violent incidents”. He told Loving Dalston it would be made clear to those arrested today that they had no future in gangs. There would be consequences for people involved in gangs, not just for those who used violence but also for other members. Further enquiries are being made throughout today. Two more arrests have been made since the dawn raids.